Probably my biggest MOC so far (3x4 BP). After a few years of building, this was meant to sum up all the experience I’ve got so far. And the bricks that I’ve gathered of course. 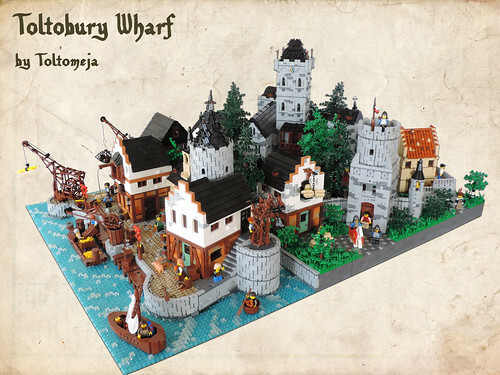 Primarily inspired by Anno 1404 game, but the build soon began to grow and evolve its style. Starting with every house being completely different, the style later became more uniform (mainly white, brown and MdDkFlesh). Thanks for your support during the WIP stage. The awareness of someone waiting for the pictures is the best motivation I can imagine! That is pretty sweet! Keep it up! Really impressive creation! The buildings are very beautiful and the combination of different styles is great and makes the town look more realistic. That guy sailing a barrel is a nice detail.